Rebate $50 available from now until Jan 1st. This rebate is offered on three Ojos de Dios still for sale on my former etsy shop, now run by apprentices that bought that shop before my move earlier this year to Oaxaca Mexico. To get you rebate, first go to YarnMandalas.com. Then scroll down to the three featured Ojos. Clicking on any of these will take you to their sales page on etsy. After buy, you must email me at jayfroggy@yahoo.com, and request your rebate, which will be sent via PayPal on or before Jan. 10, 2018. All my best wishes for the Holidays ahead! A LOT has happened in my life since my last post. I’ve actually moved from Asheville, NC to OAXACA, Mexico, which is, to me, the most beautiful city I’ve ever seen. Not only is it physically beautiful, but the indigenous culture is exceedingly rich, including a weaving tradition that goes back centuries, if not thousands of years. The other big change, I sold my long time etsy shop to three Asheville apprentices, and also my long standing domain name, Ojos-de-Dios.com. Now I am rebuilding at YarnMandalas.com, and promoting on my facebook page, Jay Mohler, Yarnmandalas.com. Besides once again blogging here, I hope to put out a newsletter monthly, You can read my latest HERE. You can sign up for the newsletter by going to this blogs newsletter page. One of the great things about mandala weaving in Oaxaca, is the yarns! Hand died, simply spun, and very available at the wonderful weaving village, Teotitlan del Valle. I’ve just finished up a 3 foot mandala using the Teotitlán yarns, pictured at the beginning of the post. Next I’ll be working on smaller, but similar mandalas. Inga is a very creative soul, and is even experimenting with techniques I have not tried out myself. Here is the first two fo what I expect to be many listing for for my etsy.com shop. You can click on the photos to enter the etsy shop pages for these all new pieces. They are part of a series, the rest to be posted soon I hope, on a Fairy Tale theme. Or, click on the ojo to go directly to it’s Etsy shop listing. 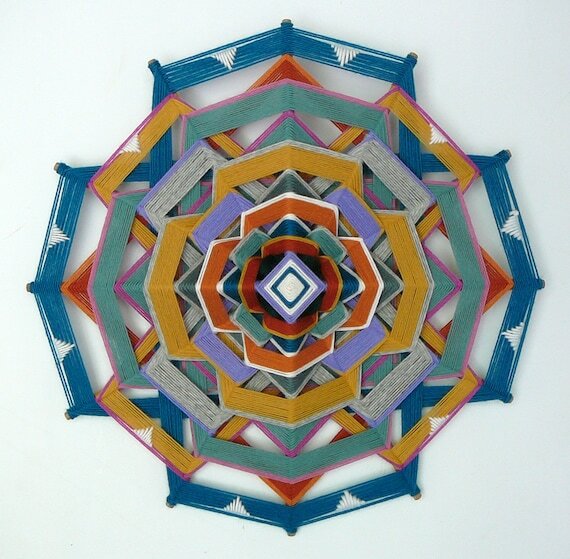 Want to learn how to weave Ojos de Dios mandalas to give as holiday gifts? Not so sure about learning from videos? I’m holding ONE WORKSHOP between now and the end of the year, scheduled for Sat-Sun-Mon, Nov. 7, 8 & 9. If only a very few sign up, it will be held in my small apartment in east Asheville, NC. If more than 4 or 5 sign up, it will be held in the much larger house of my apprentice Elizabeth, in north Asheville, NC. You can take one day, or two, or all three, with prices of $45 for the first day, and $25 for any one other day, all materials included. Email me if you have any questions, jayfroggy@yahoo.com, or call my cell: 828.707.0759. Information available online, including payment links to reserve a spot by paying in advance with PayPal. Earlier I had planned on a trip to Mexico in November, but that trip has now been put off until Jan-Feb 2016. More information on that later as plans get more concrete. I’m still swamped with custom orders to get finished up, but my apprentice Elizabeth has gotten to the point to where she can help me with almost any order that comes in, so that helps a lot. Hopefully before the holiday shopping rush sets in we’ll not only be caught up, but have built up a collection to offer on my etsy shop, and maybe even to take to a local crafts fair here in the Asheville area. For those who want really complete video instructions, up to and including weaving your own 12-sided, 24 inch Ojo de Dios, I’ve uploaded new videos to my patreon site. This is the second batch, and covers all the way to the needlework, which is usally the final stage of mandala weaving, although in this particular ojo, it gets woven in a bit before the end. It’s all based on the pictured ojo, The Pearl Within. The video clips are raw and unedited. Later, I’m going to use the experience I gained from filming these, and create a truly polished and finished instructional video, which will include adding tassels. That video will require a monthly pledge of $3 a month, but for now, all uploaded videos are available even to those who pledge as little as $1 a month. I also hope to get back to writing my biography, which includes detailed instructions and information about Ojos de Dios. This too is to be made available via my patreon.com/jaysmandalas page. 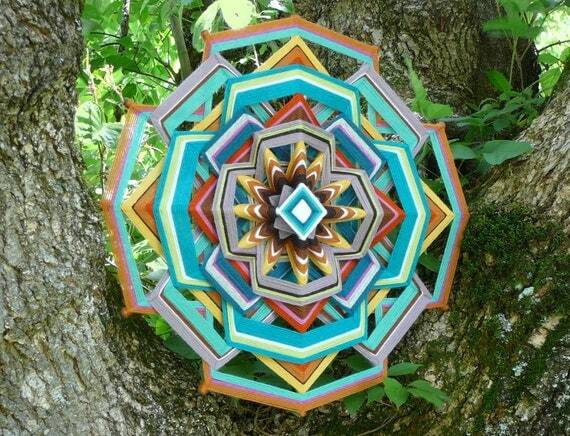 Interested in an Ojo de Dios workshop? choose your own dates! Weekdays, weekends …. one, two or three day workshops can be arranged for most any days for $35 the first day (all materials included) and $25 for additional days. I recommend three days if you want to make anything complex, but just one day may well be enough to get you started, and able to work on your own. Prices subject to change at any time. Workshops coming up in June and August, 2015, other dates available by request. Once I started weaving these new interlocking designs, of course I had to keep on experimenting, and I’m sure I’ll be weaving many more in the future. This one I think came out particularly nice. You can click on the photo to see and learn more in my etsy.com online shop. Although I’m returning to more conventional weavings, and working on my writing, for the moment, expect more such designs down the road. Spiritual significance, or artistic beauty? Usually when weaving a mandala, I am thinking only of creating artwork. Also, to me at least, in as much as a mandala might be a talisman, or have some spiritual significance, my idea is that, the more beautiful I make the mandala, the more spiritual significance might shine out to the viewer. And so, while weaving away, I seek to create the most beautiful mandala that I am capable of weaving. If you have read My Ojo de Dios Story on my website, you know that back in the 1960′s, as a young man, I discovered that Tibetans, and Huicholes of Mexico, made yarn and stick mandalas of incredibly similar design, and that this got me started on my path of mandala artist. Later, after reading a National Geographic article about Huicholi Indians, I realized that both the Huicholi and Tibetan peoples used their yarn and stick mandalas as protection from “ghosts,” or “evil spirits.” Here is a recreation I wove recently of that Tibetan/Huicholi design. Slowly over the many years of weaving yarn and stick mandalas, I’ve evolved my own style and pattern of work, which has ended up mostly being twelve-sided designs with a central diamond, and needlework of various patterns in the border. Artistically, I very much like the complexities and the design possibilities in a twelve sided mandala, but I also like the design comparisons to common Western cosmologies. I think almost every spiritually minded Westerner believes in either Jesus as the Christ, with his twelve disciples, or in the twelve signs of the Zodiac, as meaningful patterns. Myself, I believe in both, and so see twelve as a particularly meaningful number. Also the fact that twelve is the combination of three, for a three part Godhood common to both Hinduism (Preserver, Protector, Destroyer) and Christianity (Father, Son, Holy Spirit), and four, for the common pattern of the four directions commonly referred to by Native Americans, gives the number twelve special meaning to me. I virtually always weave the very center of my mandalas as a four point diamond pattern, matching the center patterns of the very first yarn mandalas I saw. I also almost always weave that center pattern with white yarn. I aim to accomplish two main things in my yarn artwork: balance of color and design that stills the mind; and a constant return of the viewers eye to the mandala center. Today many people are drawing, painting, and using computer programs to create mandala patterns. 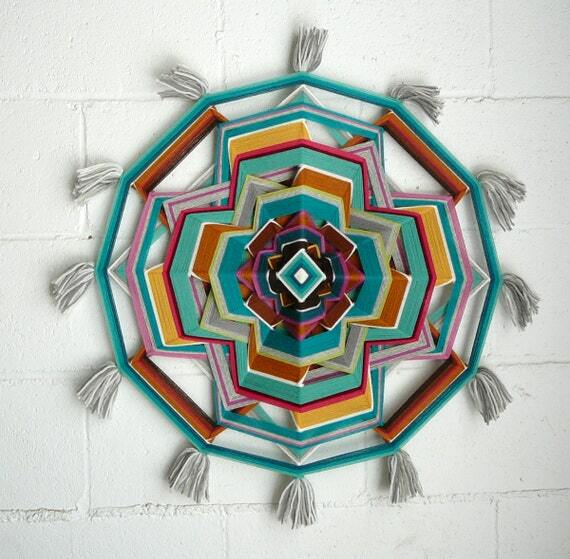 I much prefer my woven mandalas, however, with their three dimensional, stand-out-from-the-wall reality. There is one design element to the woven mandala, especially in the twelve-sided pattern, that stands unique from the other mandalas available today; and that always points back to the mandala center, and that is the empty spaces. Overall, my best hope for people that hang one of my mandalas on their wall, is that it brings a bit of beauty into their lives, and perhaps a reminder that there is a higher power watching over us, and that we can learn to remember that beyond the everyday cares of life, there is unlimited beauty, everlasting peace, and true happiness.